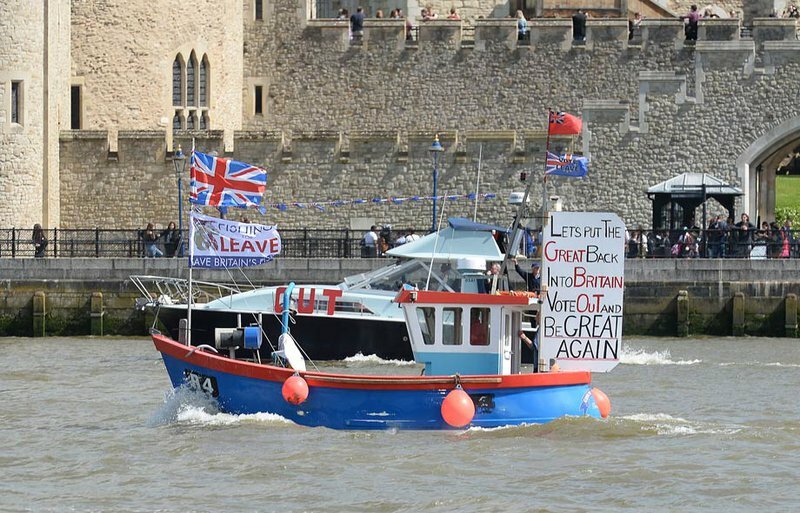 A boat forming part of a pro-Brexit "flotilla" makes its way along the River Thames in London on 15 June. John Stillwell/Press Association. All rights reserved. Many observers have pointed to the unexpected consequences of David Cameron's decision to submit British membership of the EU to a referendum: the prime minister wanted to use this referendum to shut down once and for all the internal row within his own party over Europe. He was convinced that the reforms he had negotiated with the other member states would persuade the British people to vote in favour of staying in the EU. However, this bet has proven more perilous than he anticipated. Less than a week before this crucial vote, the polls have been incredibly tight and the most recent indicate that the Leave campaign is leading by a significant margin. Certainly, the United Kingdom has always been a reluctant member of the EU: it hesitated before joining the European club and then secured numerous ‘opt outs’ concerning essential elements of EU policy and treaties. Nevertheless, at least two other elements seem decisive in explaining the striking rise of euroscepticism in the United Kingdom. On the one hand, we have the broader structural factors accounting for the anchoring of euroscepticism in the EU in general. On the other, we have the daunting failure of progressives to grasp European integration in a positive manner. After examining these two elements, I will briefly outline a potential alternative that would give primacy to the rehabilitation of sovereignty at the European level. Although euroscepticism is particularly strong in the United Kingdom at the moment, and although the term itself was first used in this country, it is not a purely British reality. As shown by most academic literature on the subject, euroscepticism has not only slowly risen in recent decades, it has also become a quasi-mainstream phenomenon. The end of the ‘permissive consensus’ towards the EU started with the debate surrounding the Maastricht Treaty. Since that time, various parties and movements have used the rejection of the EU as one of their defining features. More recently, they have become more mainstream in the political landscape. Indeed, eurosceptic parties obtained about 30% of the votes in the last European elections and have increasingly become contenders among the centre-left and the centre-right. There is another reason why it is a mistake to maintain that euroscepticism is a purely British phenomenon: such an assumption tends to blur the important ideological differences between left-wing and right-wing anti-EU positions. While there is no coherent and audible form of left-wing euroscepticism in the United Kingdom, this is not the case in other member states; it suffices to read the arguments expressed by actors such as Podemos, Syriza, Die Linke, or the Front de Gauche to realise that euroscepticism cannot be grasped as a purely national phenomenon either in its content or in its causes. And indeed, the causal factors explaining the rise of Euroscepticism are deep and structural. They are also linked to the state of the EU itself. Decades of partial Europeanisation in an increasing number of fields have critically undermined national sovereignty. The cultural dimension of state sovereignty – national identity – is certainly alive and well, but the exercise of sovereign powers by national governments has increasingly become an illusion because of the way European integration has started affecting numerous core policy areas. This analysis has applied to the macro-economic field, the implementation of social and taxation standards, the control of borders, security policies and of course the decision-making process. When something is not totally gone, one is more likely to cling to it. In other words, the democratic, economic, and coercive aspects of sovereignty have all been affected by European integration. Deprived of effective sovereignty, political actors have been unable to implement their programmes and long-term political projects, thereby feeding the rise of populist voices demanding the return of political agency. These populist discourses are mainly about recovering democracy, which is perceived as the will of a circumscribed and culturally homogeneous people. This being said, the United Kingdom has always had a special status within the EU. It has preserved elements of its national sovereignty that the other member states have clearly lost: for instance, being outside of the economic and monetary union means that the United Kingdom still has its own currency and monetary policy. This special status might be the reason why the sovereignty card works so well in this country: for the United Kingdom, sovereignty has not turned into a purely cultural myth but instead can still be said to exist in practice. This is reinforced by the fact that the United Kingdom’s national deputies have kept significant control over EU decision-making processes, thereby confirming the cliché that the British political system epitomises parliamentary democracy. This slightly less pronounced diminution of national sovereignty might explain the success of movements attempting to claim back sovereignty, including those within mainstream parties: when something is not totally gone, one is more likely to cling to it. However, the relative success of the Leave campaign cannot be explained merely by the combination of these broader structural factors – the partial Europeanisation of a number of fields – and by particular national political characteristics. It is also due to the terrible weaknesses of the Remain camp. On this side, we find the entire British establishment, the leaders of the main political organisations, the big trade unions, powerful organisations such as the IMF, and even the president of the United States. And yet, it does not seem that this impressive coalition will secure a victory for the Remain vote. And even if it does, it is very unlikely to be a landslide. The gap between the voices praising European social realities and those arguing for the necessity of building a genuine social Europe is enormous. One critical cause of this lack of enthusiasm is the mainly negative arguments put forward by the Remain camp. These highlight the danger to the British economy, security, and social welfare should a Brexit occur, or point to the lack of accuracy in the figures and facts hammered out by the Leave campaign (on the British contribution to the EU budget, on the ‘cost’ of immigration, or on the supposed future Turkish membership of the EU). This negative stance is also blatant regarding the Tory faction that is in favour of continued membership: their position has not been grounded in a pro-European vision but in a eurosceptic one, and has been linked to demands to renegotiate fundamental aspects of the UK–EU relationship. Moreover, what has been terribly lacking in this campaign is not only a positive view of what the EU in its current state does bring to the United Kingdom, but also a longer term project to redirect and improve the EU itself. Of course, this sort of alternative positive vision for Europe was unlikely to be voiced by the Conservative eurosceptics. But it could have come from progressive political forces. The Labour Party, the Liberal Democrats and the Greens are, broadly speaking, pro-European, but are deeply divided on what sort of path the EU should tread in the future and on how the United Kingdom could influence it. In particular, the biggest political force in the opposition, the Labour Party, is extremely torn on the EU: the gap between the voices praising European social realities and those arguing for the necessity of building a genuine social Europe is just enormous. Internal divisions also appear on the link between European integration and immigration, on the sort of macro-economic policy that should be adopted at the EU level, and on the institutional reforms necessary to democratise the EU. These more or less latent divides have clearly prevented the Labour Party from expressing a clear and convincing approach during this campaign. In the current European and global context, a progressive reformist position has become harder for social democrats to adopt or at least hold in practice. But for the centre-left, the problem is actually deeper. In the current European and global context, a progressive reformist position – I am using the classical meaning of that term: seeking an alternative to make the economic and political system less unjust – has become harder for social democrats to adopt, or at least to hold in practice. In several European countries, this is leading to increasing rifts within social democracy between more and less radical factions. The only way social democrats will be able to win over a majority of citizens is by radically reshuffling their ideology and strategy and, finally, settling their muddled stance on European integration. In that respect, the question of sovereignty is a key issue since it is the indispensable means to political agency. Social democrats will have to reclaim this notion if they want to counteract the rise of populists. Contrary to a view shared by eurosceptics and Europeanists alike, a fully-fledged European federalism could constitute a solution to the current crises facing our societies. In that respect, it is important to note that what is often denounced by eurosceptics as federalism is actually the Europeanist justification of the hybrid status quo that characterises the EU: a majority of Europeanists – in academia, think tanks, and policy-making – have elaborated various theoretical accounts of this hybrid set of institutions located as they are between a supranational federation and an intergovernmental organisation. When applied to European integration, the federalist approach has lost some of its main features, including sovereignty. Indeed, a genuine federal organisation does not divide sovereignty; in such configurations, the federal government is the only one to hold sovereign powers, while federated entities have only particular competences but do not possess sovereignty as such. In practice, what we now have is therefore a hybrid construction, clearly integrating further in some areas, but absolutely not a federal state. From this perspective, advocating for a federal Europe would actually be a way of rebuilding sovereignty. Only by rehabilitating sovereignty at the relevant level – and for European nations, this can only be the European level – can political agency be rescued. Thus, there is a possible alternative that is pro-European but also critical: a project for a democratic federal Europe. Any European country, by itself, is incapable of facing challenges that are inherently European and even global in some areas. Any individual country, including the United Kingdom, is too small to deal with the current environmental, migration, economic, and security crises. Yet pro-Europeans can only be convincing if they reclaim the notion of sovereignty. This would require a radical refurbishing of the notion of federal Europe. Most importantly, a renewed federalism should grant priority to the building of a genuine European sovereignty. A sovereign Europe means that sovereignty would no longer be divided. When this happens it ceases to exist, as we have seen in practice in the European case, and it generates strong reactions demanding the restoration of sovereignty at regional and national levels. Instead of trying to preserve this status quo, pro-Europeans should clearly seek a sovereign Europe. This means that a central government at the EU level – this could be instituted, of course, among only a few states – should be the only entity holding sovereign powers, while the federated entities would only possess competences. This setup would lead to a few concrete implications such as the creation of a monopoly of the use of force at the European level – in other words, a European army, police, and intelligence service; properly European immigration and asylum policies, as well as border management; and the creation of genuine macro-economic tools at the EU level. This would mean, at minimum, a substantial EU budget of at least 15% of EU GDP funded by European rather than national contributions. Only a federal entity provided with sovereign powers would be able to guarantee the security of its citizens, control its borders, respond to environmental emergencies, boost its economy, and reduce unemployment and inequalities. Only by rehabilitating sovereignty at the relevant level – and for European nations, this can only be the European level – can political agency be rescued. Such a European sovereignty, if it were promoted by pro-Europeans, should, however, clearly break with the oligarchic tendencies currently affecting the EU. Indeed, sovereignty is not per se democratic. A European representative democracy would require some of the following elements: a European parliament holding the right of legislative initiative and entitled to full political control of the executive (a transformed commission), the disappearance of the European Council and the substitution of the council of the EU with a second chamber composed of national representatives, and the election by all European citizens of a president of the EU. If such radical reforms were to be implemented, politics and policies would match at the European level again. Citizens would once more have a say over the policies that directly affect their lives. In a progressive project, some controls and limitations would also have to be imposed on this renewed European sovereignty. Not only can sovereignty be undemocratic and oligarchic, it can also develop totalitarian tendencies – for instance, by contradicting individual and minority rights and by being prone to arbitrary tendencies. The best way to prevent this would be to submit a sovereign Europe to the rule of law principles. The content of the rights protected and of the details of the European institutional architecture should, however, derive from a democratic deliberation and vote leading to a shared constitution. Finally, sovereign powers at the European level should not be legitimised by identity or even common values, but merely by common interests. Put differently: an instrumental and liberal justification of political agency should be used, rather than a communitarian one. At the end of the day, what most voters supporting a Brexit desire is to recover a say over collective decisions or, in other terms, to ensure that their individual voices are heard and represented by politicians. This will not be the case if the United Kingdom leaves the EU, because the United Kingdom is too small a country to be able to respond alone to the huge social, economic, and environmental challenges that it is facing. A fully-fledged federalist project, supported by progressives in some key member states of the EU, would be a much better instrument to rebuild political agency than the nationalist back-pedalling offered by eurosceptics. Such a project could be defended by progressive pro-Europeans. It might be that after an almost inevitable phase of disintegration, this project will finally be put in place among a small group of sensible states. And we can only hope that the pro-European forces in the United Kingdom will join the supporters, whether their country remains a reluctant member of the club or an estranged outsider. But if the United Kingdom does leave the EU, it will still have much to teach the rest of Europe, particularly regarding the contested notion of sovereignty.